If you’re counting down the days until the next chance to get an “I Voted” sticker, make sure you’re registered before Election Day. 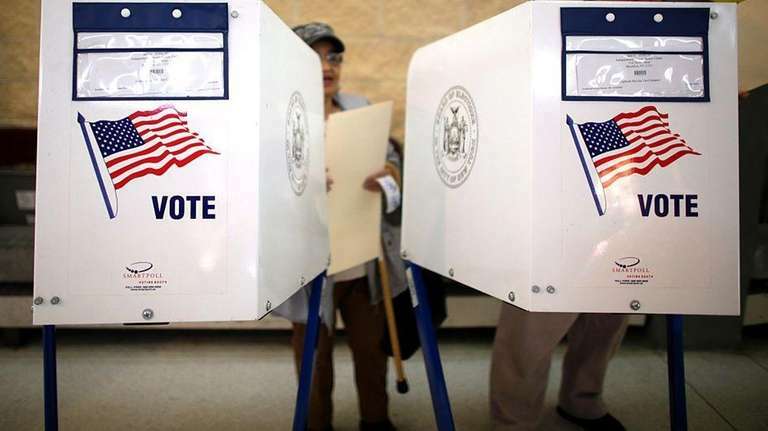 The deadline to register in New York for the Nov. 6 general election is Friday. Below are three ways New Yorkers can register, and if you need to check the status of your registration, check here. If you have a New York State ID, you can register on the Department of Motor Vehicles website, using its online Voter Registration Application. The DMV will forward the form to your county Board of Elections for processing. You will need your DMV-issued driver's license, permit or Non-Driver ID; your ZIP code that is on record with the DMV; and the last four digits of your Social Security number. If you don't have a state ID, go to the New York Board of Elections website to download the Voter Registration Form. You can either fill out the form online or after you print it, but you must sign it once it has been printed. Send the completed form to your county's Board of Elections. The addresses are listed on the second page of the document. The form must be delivered or mailed at least 25 days before Election Day to be effective. You can also update information, such as your address, with the same form. You can register at your county's Board of Elections office (addresses here), a DMV center or the offices of one of these agencies. Why does NY have more than 1 primary election?New Yorkers voted in a primary in June, but there's another one tomorrow.